In Office 2011 for Mac applications, you can apply a fill to almost any shape that is not a point-to-point line. This includes shapes from the Media palette and shapes in graphs such as those representing series. The fill color is separate from the color of the line that surrounds a shape, which is formatted independently. The term solid fill means that the fill color is uniform throughout the shape. In the Format Shape dialog, you access these options by choosing Fill in the left column and then clicking the Solid tab. Color: Click this area to bring up a pop-up menu that lets you choose a solid fill color. No fill: Makes the fill area of the shape completely empty. You can see through this shape if you position it above another shape or text. If there’s nothing behind this shape, you’ll see the background. Such shapes continue to have a line attribute that remains visible unless you turn that off, too. If you do that, you just created an invisible object! Theme Colors and Standard Colors: Click to apply. More Colors: Opens the Mac OS X color picker. Transparency: Use the slider, enter a percentage, or use the increase/decrease control to adjust how much see-through you need for the selected shape. 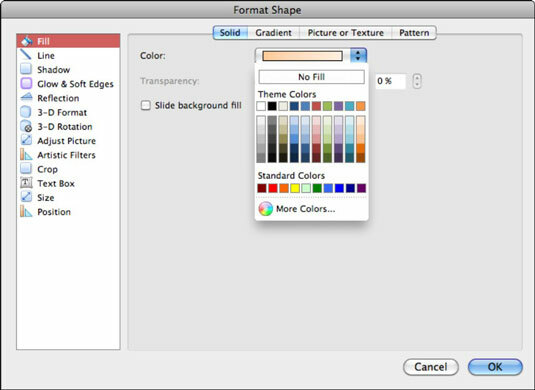 Slide background fill (PowerPoint only): Select this check box to have the shape’s fill match the slide background.